NOTE: This Is A Made To Order Item... Please Allow Up To 14 Days For Item To Be Made Before I Can Ship This Out...Thank You.. 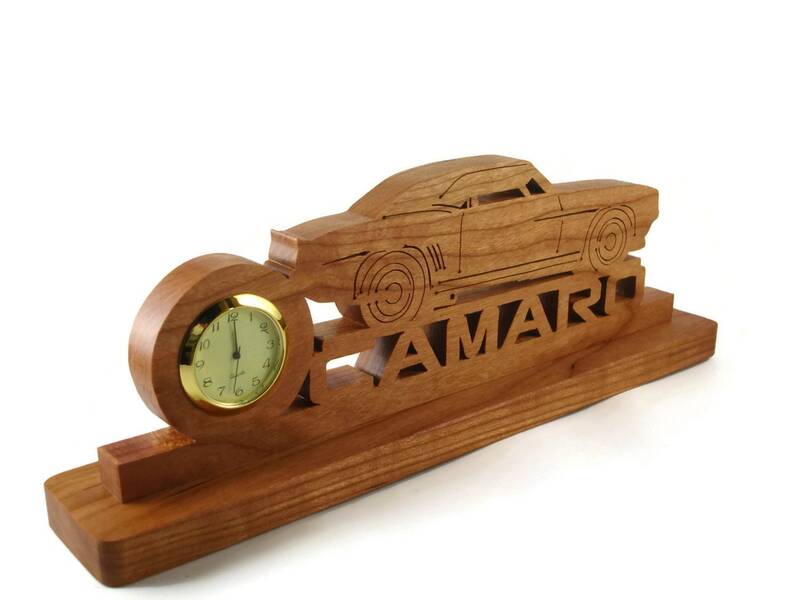 If you or someone you know is a muscle car enthusiast, specifically the Camaro.. then this is the perfect gift to get for yourself or that special Camaro enthusiast.. 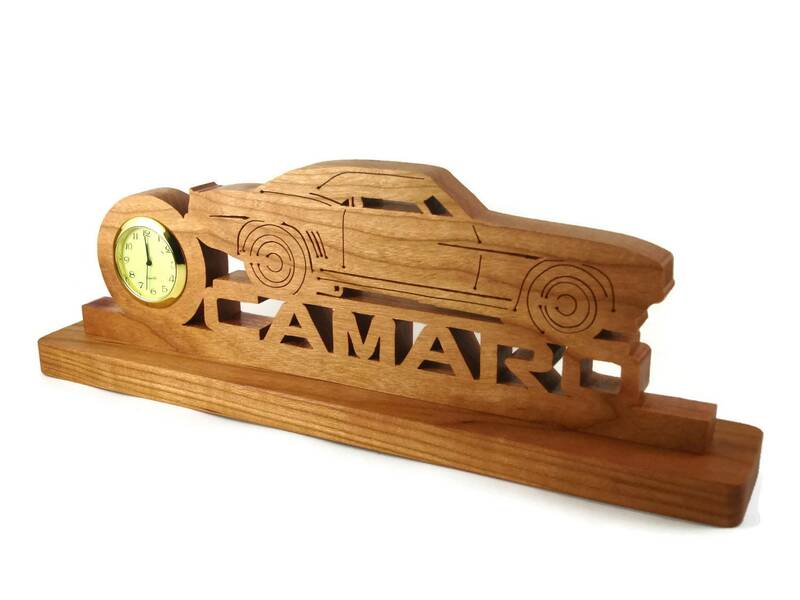 This Camaro desk or shelf clock was cut by hand ( Handmade ) from Cherry wood using a scroll saw and features a right hand side view of the Camaro. 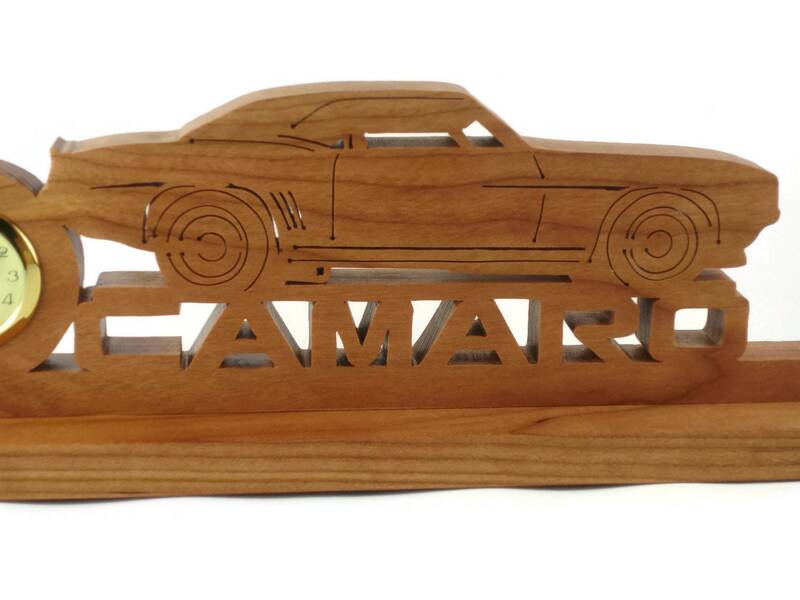 Below the car is the word " Camaro" .. This is glued to a 2 x 11 inch base for stability. A all natural homemade mixture of beeswax and mineral oil finish was applied to give the wood a beautiful all natural rich look while also protecting the wood for many years of enjoyment. The 1-7/16 inch Quartz clock insert features a ivory color face with black Arabic numbers covered with a mineral glass lens, and surrounded with a gold plated bezel / trim. A stainless steel back cover encases the little watch style battery. Battery is installed and ready to be activated. 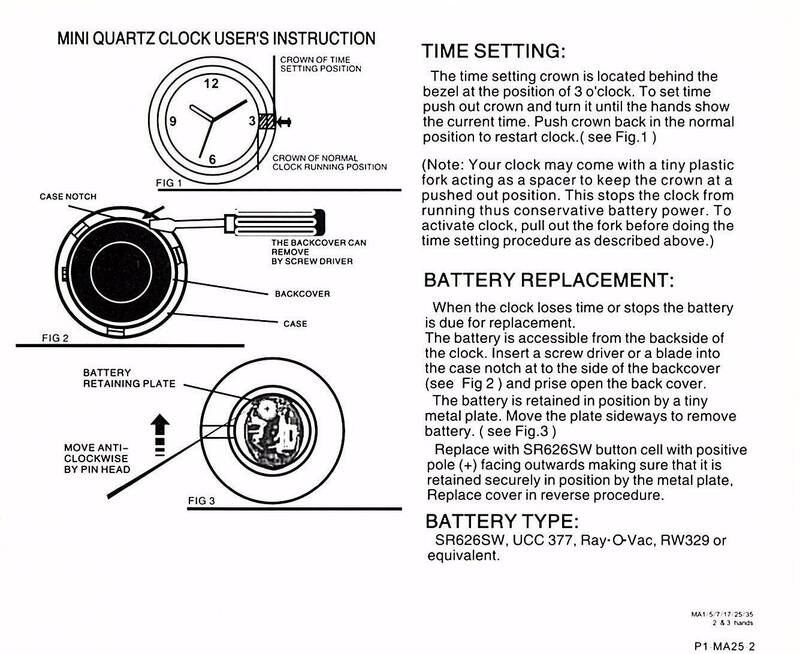 Clock is powered by a Seiko watch motor.Clock is just pressed into a recessed hole and can be removed to replace the battery and for setting the time.. 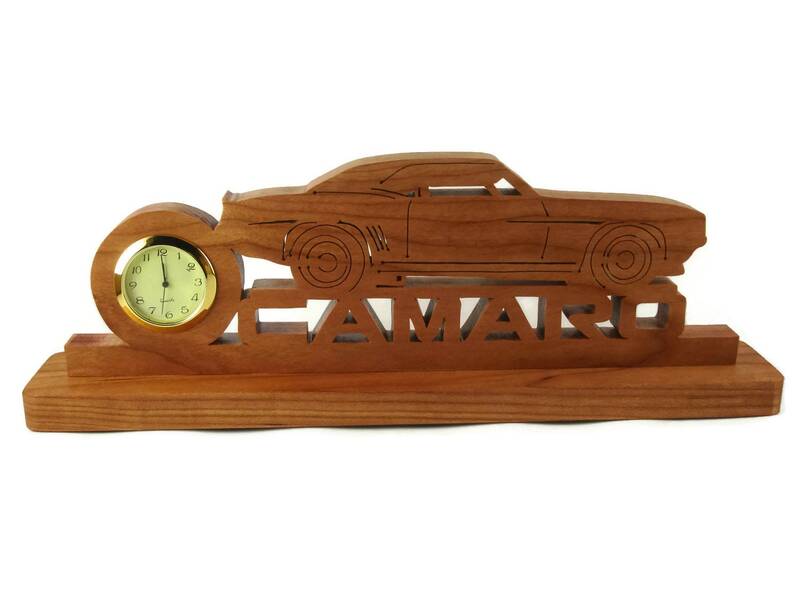 The seller went above and beyond for me and I received the clock in very good time! 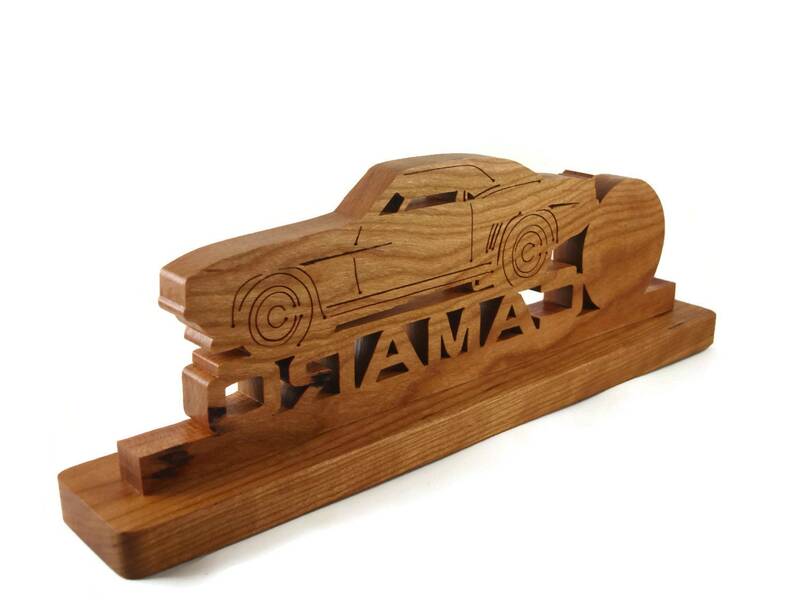 It is quality material and looks professionally made. I’m thrilled with the purchase.